Dogen Founded Eiheii-ji in 1243. In the late summer of 1243 Dogen was invited by local disciples to establish a temple in Echizen, the province where Eiheiji is. At that time he moved his growing community of monks from the capital area of Kyoto up to a beautiful and remote mountain valley. Over the subsequent centuries Eiheiji has expanded into one of Japan’s largest monastic communities whose main buildings and halls are tiered up steep hillsides and connected by long staircases protected against the winter snows. The climates of Shasta Abbey and Eiheiji are rather similar. 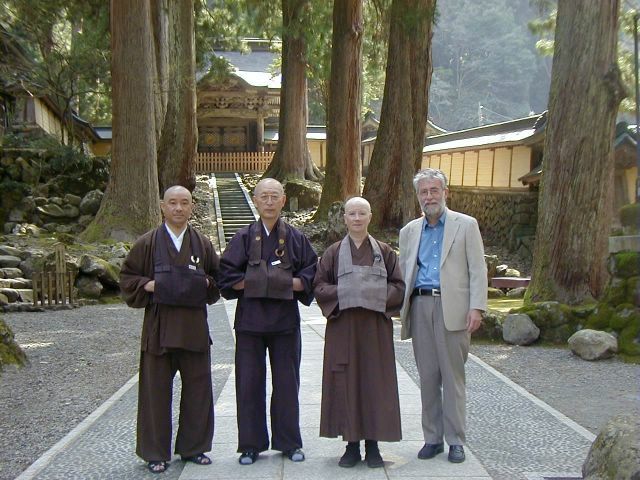 Eiheiji is now a huge international institution, accepting more than 200 new trainee monks every year. Typically they study here for a minimum of two years after university before returning to a home temple. Visitors are looked after in a large guest building with comfortable Japanese-style tatami rooms and are able to join in the schedule during their stay. From left to right, Rev. Kuroyanagi (International Department), Rev. 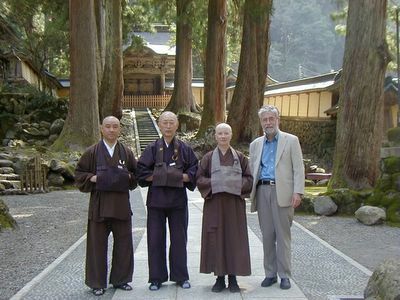 Matsunaga Roshi (Assistant Administrator), Mugo and Iain.